The Legend Villas holds open house for wedding packages. 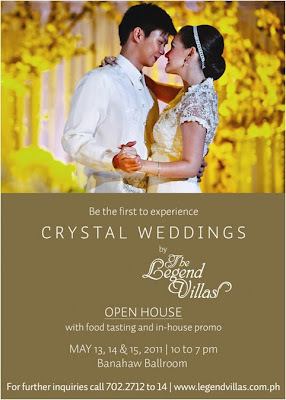 Couples, event organizers and suppliers are invited to the Crystal Weddings Open House at the Banahaw Ballroom of The Legend Villas on May 13 to 15, 2011 from 10:00am to 7:00pm. 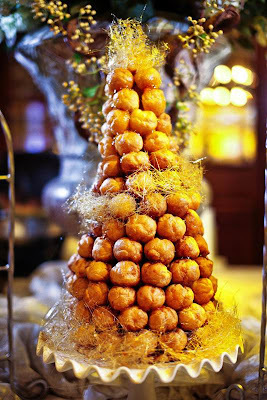 The event will showcase the hotel’s unique Crystal Weddings themes – the magical Quartz and sophisticated Onyx. “We have been receiving numerous inquiries on our Crystal Weddings packages since we launched it last March. We decided to organize an open house so our clients can see for themselves the actual wedding set-up. The 3-day event also entitles guests to free food tasting and in-house promos,” said Karen Reyes, Sales and Marketing Director of The Legend Villas. 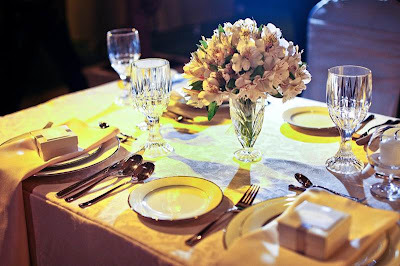 “Our Crystal Weddings packages guarantee top-notch service, stylish set-up and sumptuous feast. Starting rate for 100 persons actually costs only Php 155,000,” added Reyes. nice theme parang relax lang!! !